We woke to find the ship safely anchored in the harbor in St. Kitts. The day was overcast, dark, gloomy, hot and humid. We joined Dave and Darlene in the dining room for breakfast. The buffet breakfasts were good, and the choices plentiful. But in the dining room, there was table service and the hustle and bustle of servers meeting one’s every request. We ate a leisurely breakfast then made our way down the gangplank to spend the day on St. Kitts. Our ship’s itinerary said, “the city of Basseterre has one of the most tragic histories of any Caribbean capital, destroyed many times by colonial wars, fire, earthquakes, floods, riots, and hurricanes.” There were, however some structures that had survived the devastation—the Treasury Building at the waterfront, the Circus—built to resemble Piccadilly Circus in London, and the St. George Cathedral. As we disembarked and made our way down the pier, we all decided that we would take a walk around the town before hiring a cab. The Circus was similar to Piccadilly Circus, but much smaller. St. George’s Cathedral was originally called Notre Dame by the French who built it in 1670. The name changed in 1869 when the cathedral was rebuilt. After our brief walk, we walked over to the cabbies. Most of the cab drivers were asking for $50 or $60 for a tour of the island. Mike and Dave made a deal with Trevor, and we all climbed into his air-conditioned van. Trevor was very talkative and proud of St. Kitts. 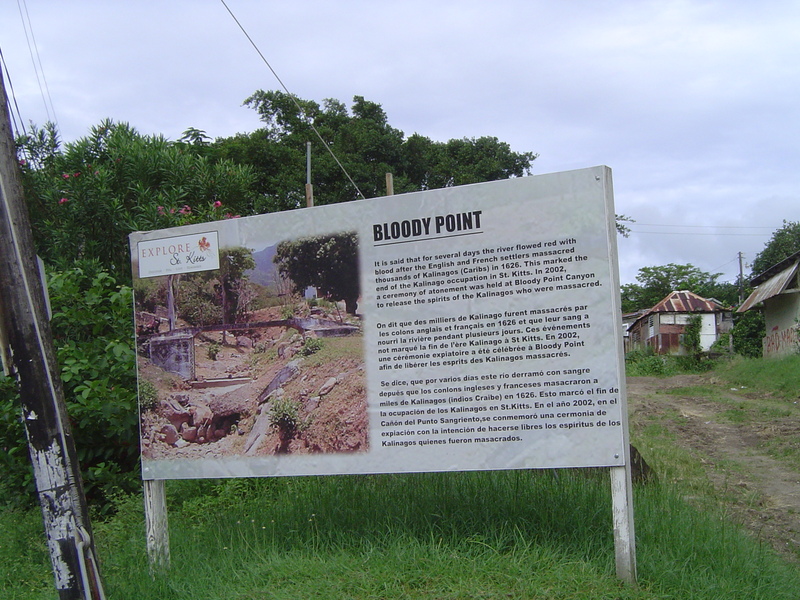 He drove north from Basseterre to Bloody Point—the place where the French massacred the Carib Indians (Kalinagos) in 1626, thereby ending the Caribs’ presence in St. Kitts. Mike and Dave got out of the van to take pictures and while they did so, a woman approached the van with bags and dolls for sale. I bought one of each—trying to support the local economy. From there, we went to Wingfield petroglyphs. 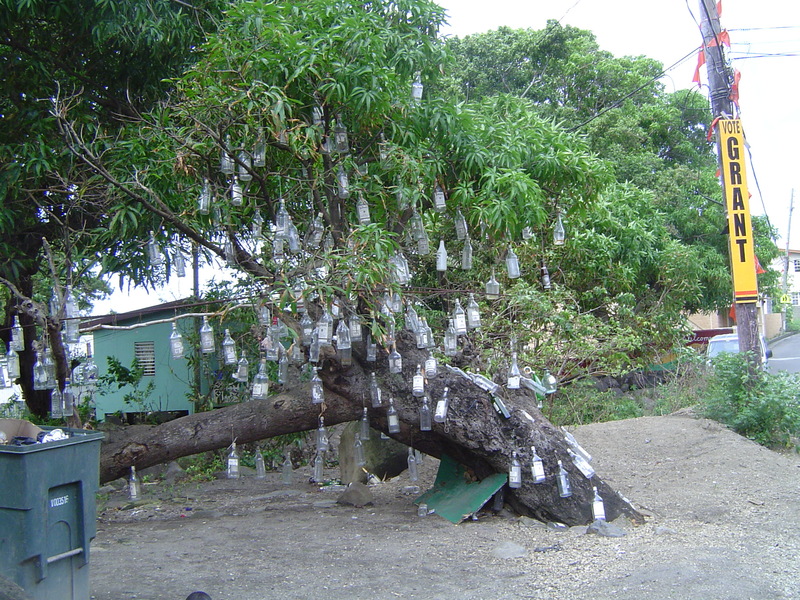 En route, Trevor showed us a tree where the locals hang their alcohol bottles once they finished the contents. We’re not sure why they did this, but it made for an interesting diversion. From there we headed for Romney Manor and the Caribelle Batik Factory. The estate was originally owned by Thomas Jefferson. He sold it to the Earl of Romney who renamed the property Romney Estates. 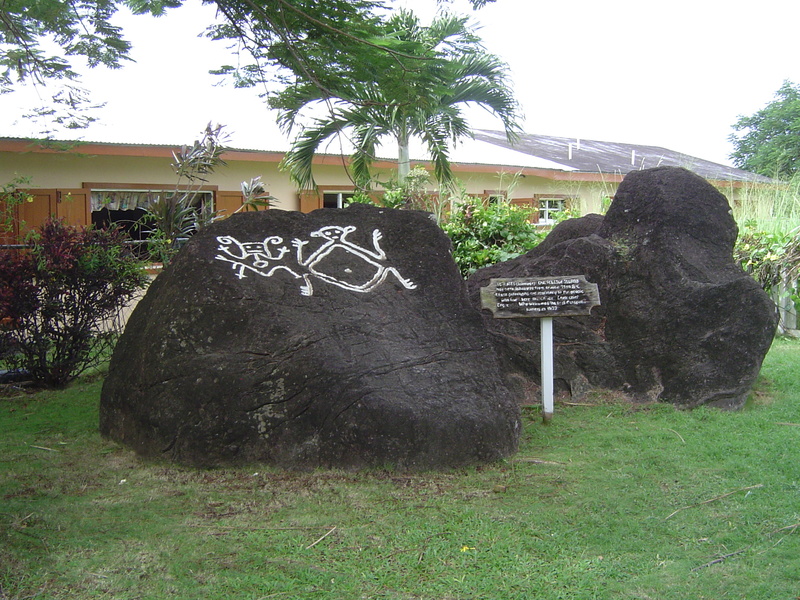 The name has remained for more than three centuries. 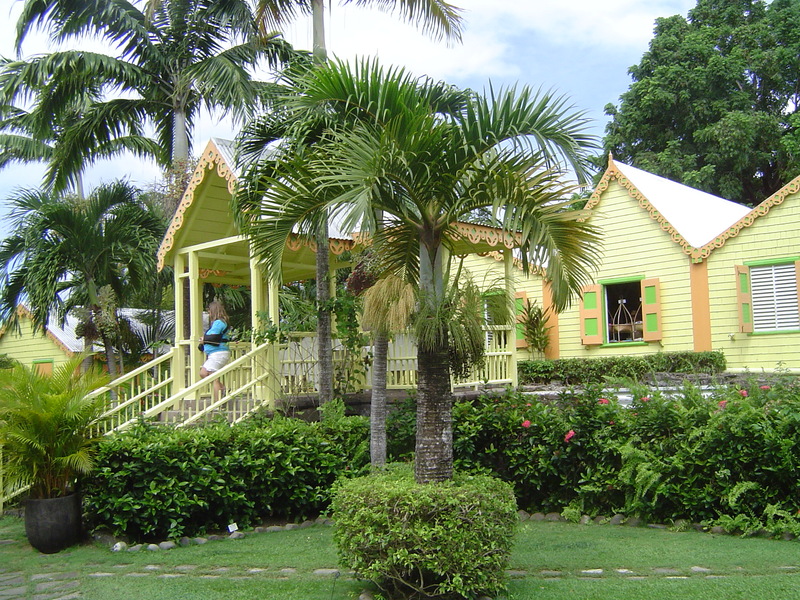 The Caribelle Batik Factory, located inside Romney Manor was founded by Maurice Widdowson in 1974. Widdowson still owns and operates the factory. We spent about 45 minutes at Romney Manor enjoying the grounds and watching a batik demonstration—the intricate steps of dying the fabric, applying wax, re-dying, to create beautiful wall hangings, clothes and table linens. 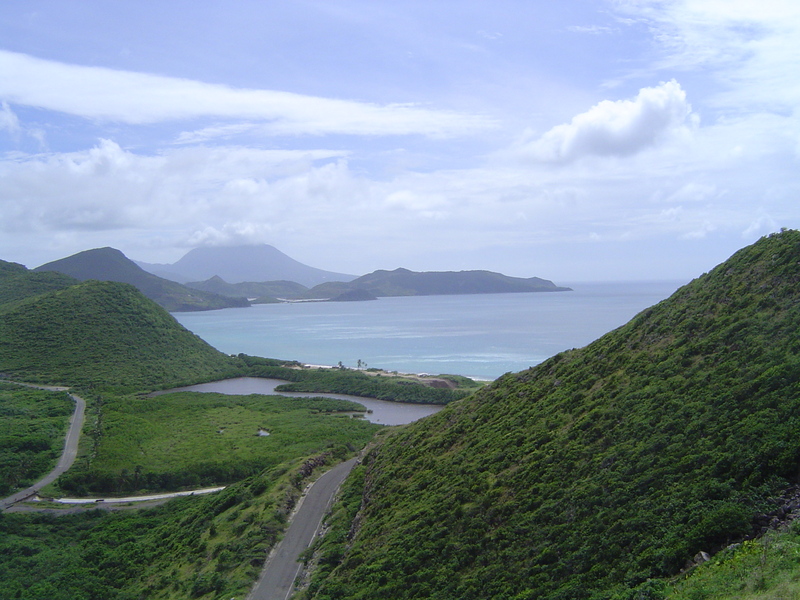 After Romney Manor, Trevor drove southeast, back toward Basseterre and headed for Frigate Bay—two bays on the isthmus that join the peninsula with the rest of St. Kitts. The view was spectacular. When we got out of the van, a young man was waiting at the top of the hill with a pile of fresh aloe vera and a huge knife. He chopped the plant extracted the gooey insides and began rubbing it all over Dave. Dave thought this was a very friendly gesture but was somewhat surprised when the man wanted $5 for the aloe application. Dave declined, but the man insisted. They agreed to a sum, and we left with Dave a bit more moist than when we arrived. On our drive back to Basseterre, Trevor stopped at a gas station and we bought some Carib beer—a local lager. The beer was ice cold, and delicious. We enjoyed the beer on the drive back to Basseterre—drinking in a car is legal in the Caribbean. When we left, Trevor told us to leave the bottles anywhere on the street because people would pick them up and sell them—it’s a way for the poor to make money. 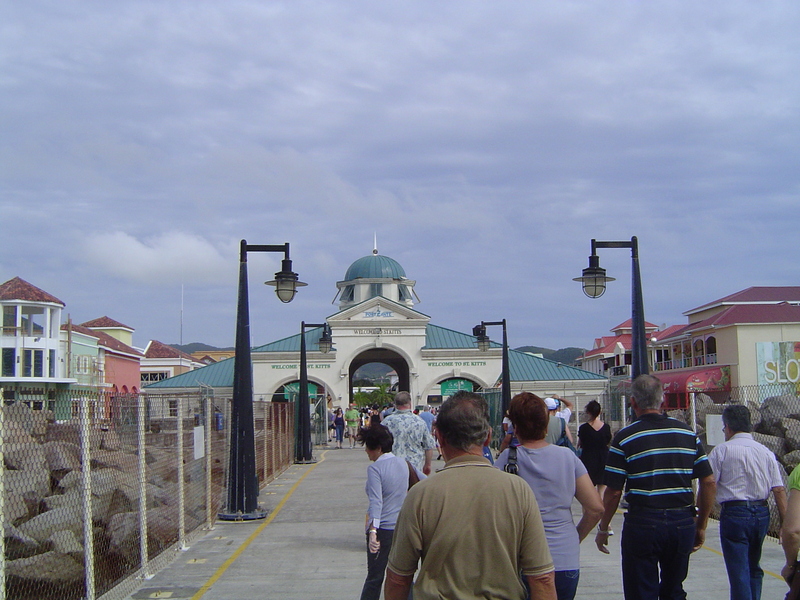 We visited a few shops in Basseterre and then made our way back to the ship. We were once again greeted by our ship’s crew with an ice-cold washcloth and water or punch. Later that day, Mike and I talked about our cruising experience. It was different than any other type of vacation we’ve taken and we weren’t sure if we liked it or not. That evening at dinner one of our tablemates asked us how we were enjoying our ‘maiden voyage’. “We’re not sure” we responded. And later that evening, as we sat on our balcony watching the swirling ocean below us and the starry skies above us, we talked about what we were enjoying, what we would change and if we would ever repeat the experience.